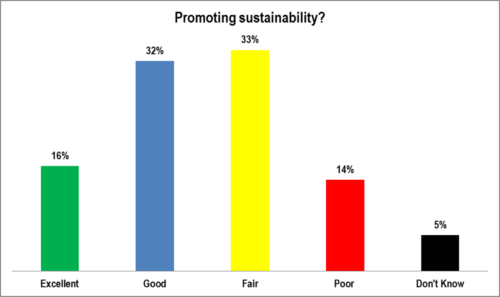 Mayor Piercy is probably best known for promoting the “triple bottom line” for sustainability. For this emphasis she received 16% excellent rating and nearly half rating her performance at excellent or good. QUESTION: Now I would like to list a set of issues facing Eugene and ask you to rate how well Mayor Piercy did on each issue: excellent, good, fair, poor? 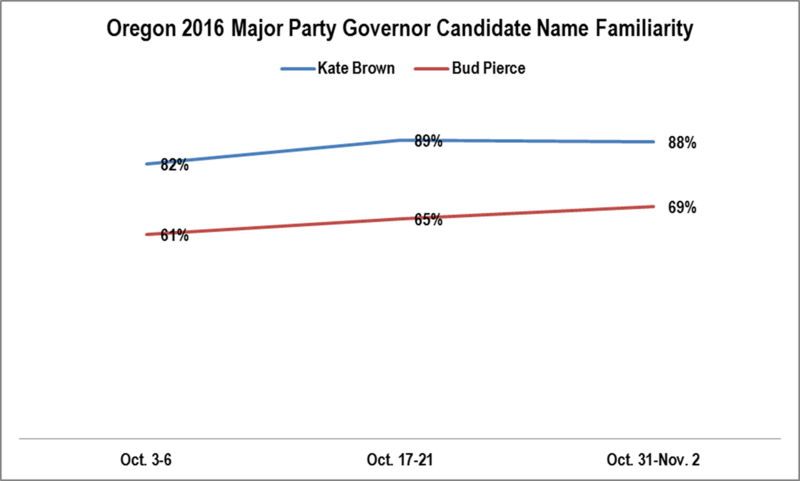 Brown maintained a name familiarity advantage of around 20% throughout the campaign. This polling result should best be taken as a Eugene-centric perspective. 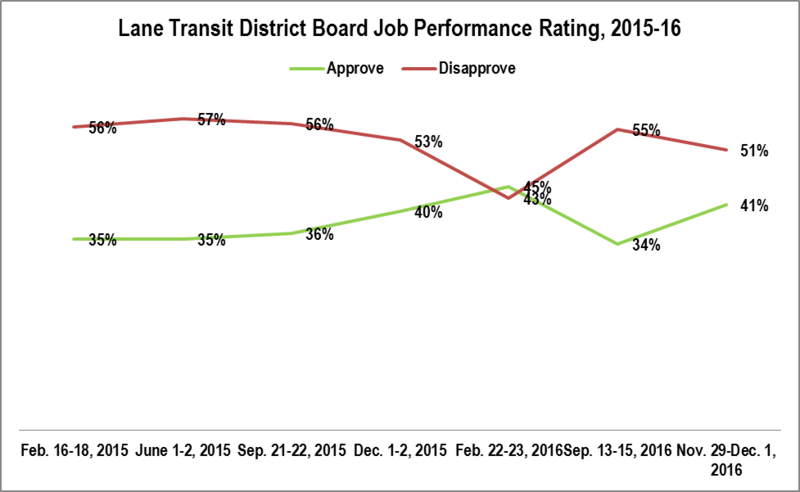 Eugene, being the big city in the county, is always going to have some level of friction with the rest of the county just as Portland has friction with the rest of the state. 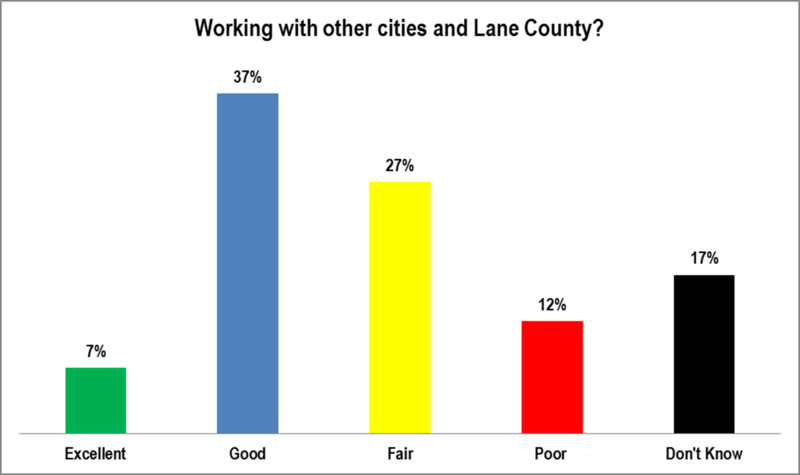 Working with other cities and Lane County? 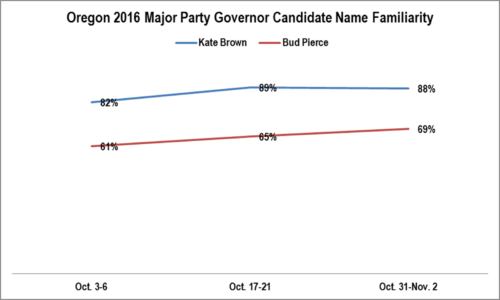 Brown maintained a solid lead throughout the campaign. 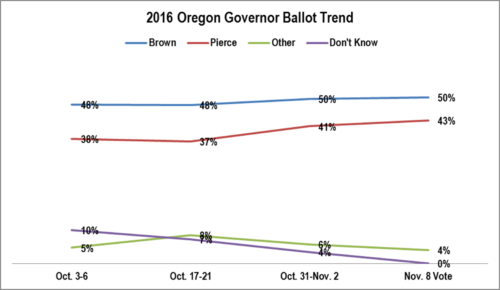 It is important for future strategists to note that Brown was never above 50%. 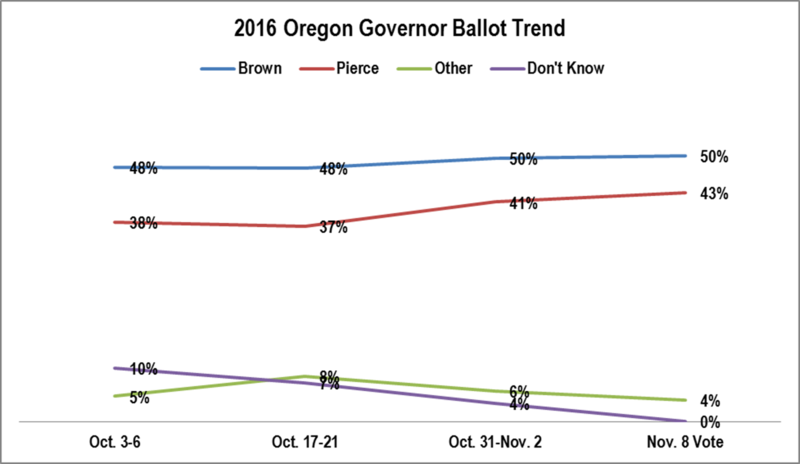 Starting tomorrow and continuing regularly on Thursdays will be a series presenting polling and electoral analyses of Oregon’s 2016 General Election. 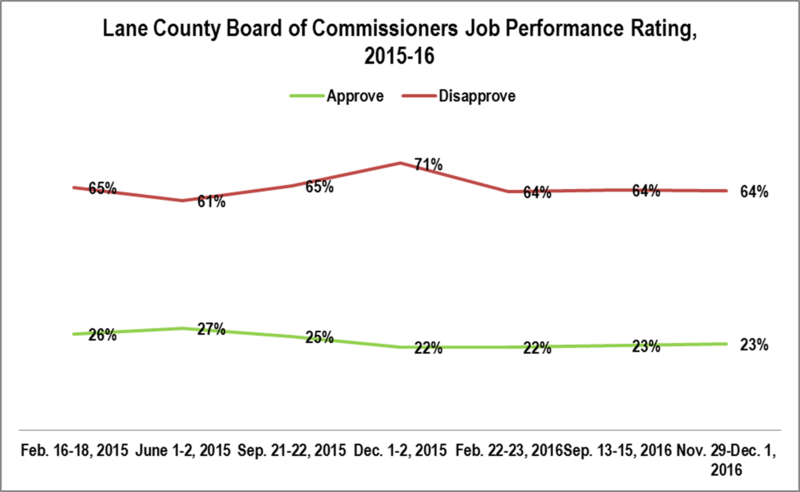 With 57% positive, this was Mayor Piercy’s strongest area. This should not be a surprise to anyone who has watched her. Protecting wetlands and other environmentally sensitive areas in the city? Starting tomorrow and continuing on Tuesdays will be a series of posts discussing Mayor Kitty Piercy’s legacy in Eugene. It will include posts about how people viewed her as she left office and how successful she was implementing local policies. Kitty Piercy served as mayor longer than any other under the council-manager form of government. 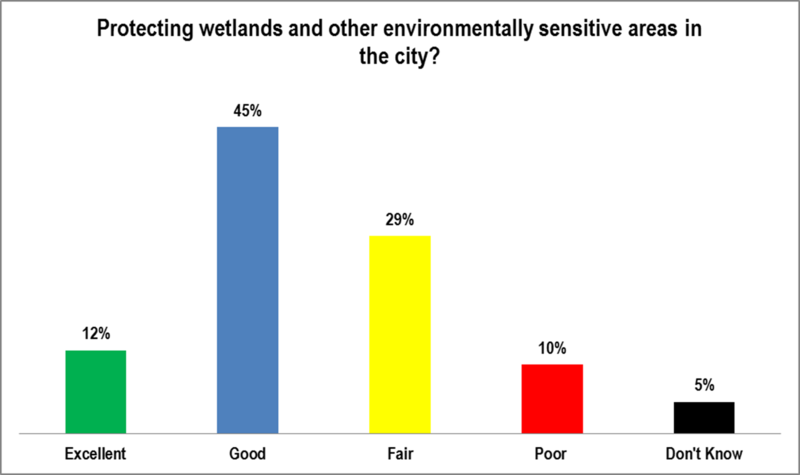 When evaluating any long-serving mayor, it is useful to have some perspective. Elisha Large (Mayor of Eugene, 1930-1944) is the record holder. He guided Eugene through the Great Depression through careful financial management. He kept Eugene solvent when many other cities went bankrupt during the 1930s. However, his close control of city government upset many and led to the current council-manager form of government in 1944. It is worth remembering that Large is most often remembered not for the former, but for the latter. 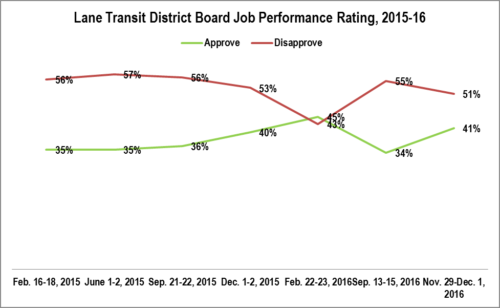 The LTD Board rating, after a stable 2015, moved around significantly during 2016. METHODOLOGY: 200 live telephone interviews of likely City of Eugene General election voters were conducted February 16-18, June 1-2, September 21-22, and December 1-2, 2015, and February 22-23, and September 13-15, 2016.The margin of error at the sample median for this surveys is 7%. 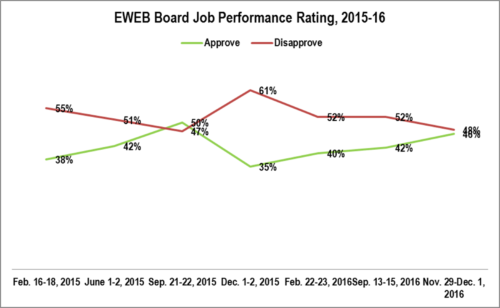 In addition, 240 live telephone interviews of likely City of Eugene General election voters were conducted November 29 through December 1, 2016. The margin of error at the sample median for this survey is 6%. 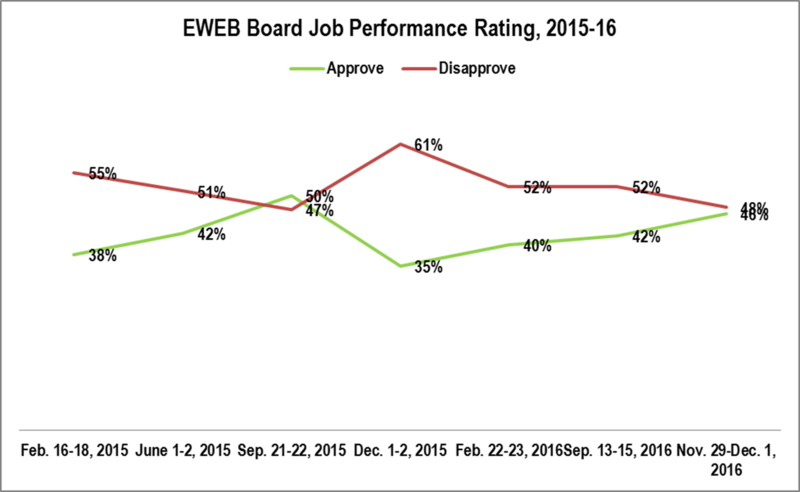 The EWEB Board’s rating has been steadily improving for the past year. Please note that the polling was done before the announcement by EWEB that there would not be a residential rate hike in 2017. The rating is would probably have increased with that news. 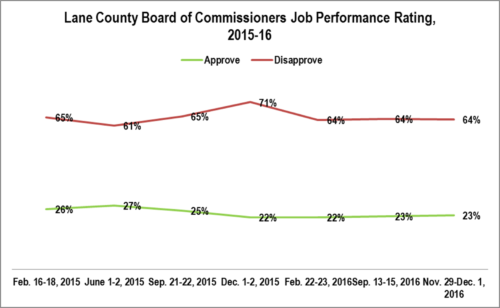 The job performance rating of the Lane County Board of Commissioners has been remarkably stable the past two years.